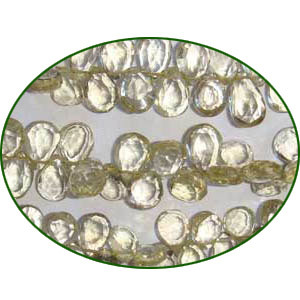 Fine Quality Lemon Topaz Faceted Pears, size: 6x8mm to 8x10mm semi precious gemstone beads to make fine jewelry, length of string 14 inch. Barb Wire Leather Cords 1.5mm round, metallic color - power blue. Gold Plated Metal Chain, size: 1x4mm, approx 35.6 meters in a Kg. Silver Plated Fancy Beads, size: 10x16mm, weight: 1.88 grams. Silver Plated Metal Chain, size: 1.5x7.5mm, approx 12.1 meters in a Kg. Sterling Silver .925 Caps, size: 5x10mm, weight: 0.59 grams. Leather Cords 4.0mm (four mm) round, metallic color - grey. Leather Cords 6.0mm flat, regular color - camel.